In 1918, Clarence Larkin published his seminal work Dispensational Truth, sub-titled "God's Plan and Purpose in the Ages." 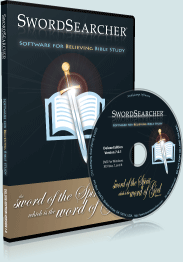 SwordSearcher Bible Software includes the enlarged and revised edition published in 1920. Though Larkin's teachings on dispensational study were not new, his extensive charts painstakingly designed by hand made the material accessible and readily understandable to new readers. 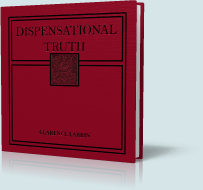 This "edition" of Dispensational Truth was created by scanning each page of the printed book, running the scanned images through Optical Character Recognition software, and finally, manually proofreading and comparing the resulting text with the original printing. Larkin's extensive use of quote marks and bold text made the OCR less accurate than usual, so great care was taken to preserve as much as possible of Larkin's original formatting. The majority of the charts from the original book were not usable as source pages for the scanning of images that appear in SwordSearcher's Image Viewer, due to their smaller size and spanning of multiple pages. Large-format copies of most of the charts were obtained and scanned with hardware designed for archiving large blueprints. The decision was made to keep most of the scanned charts in their large 400 DPI format so that the user may zoom in and inspect the details of the charts. Even so, these charts were designed almost a century ago, and in some cases detail is lacking. However, the images of Larkin's charts from Dispensational Truth in SwordSearcher are the best possible result given the source material, and are quite useful in understanding the teaching of the author. Every chart and "cut" from the chapters in Dispensational Truth is included. Larkin's commentaries on the Book of Daniel and Book of Revelation and Rightly Dividing the Word are also part of the SwordSearcher study library.